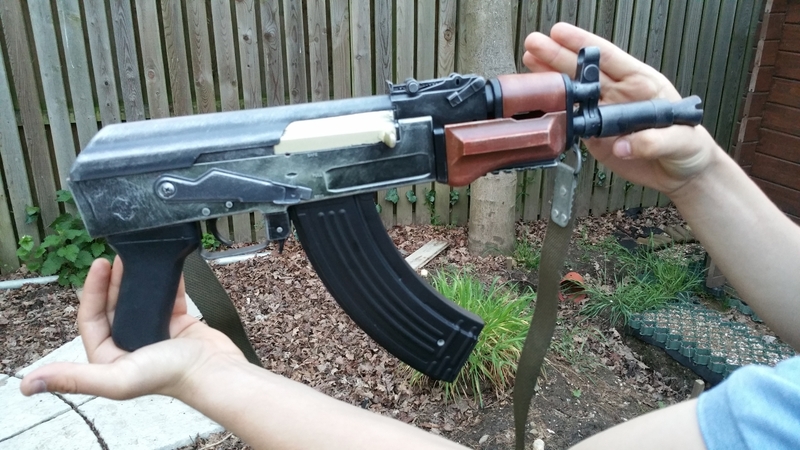 Just thought I'd share a couple of re-paints on my sons first two airsoft weapons. We got these when we were slightly less serious about getting into the sport but will form the basis of his arsenal for the immediate future. The first is the Well MB4406 from Langleys and his AK74 AEG. 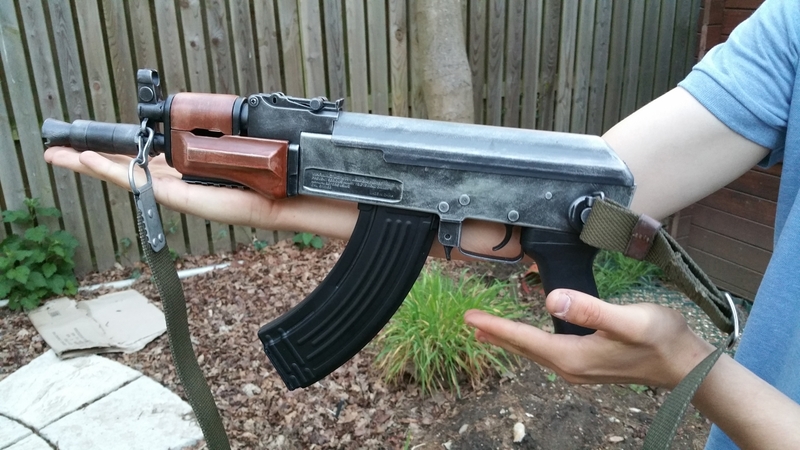 We wanted the worn out and abused look for the AK, everything you see on this gun is done with acrylics, even the wood. The sniper rifle is done in 3 colours of Crylon. Please let me know what you think. The pedant in me is screaming at the AK47 mag in your AK74 though. But not at the fact the TM Beta is a completely fictional gun? 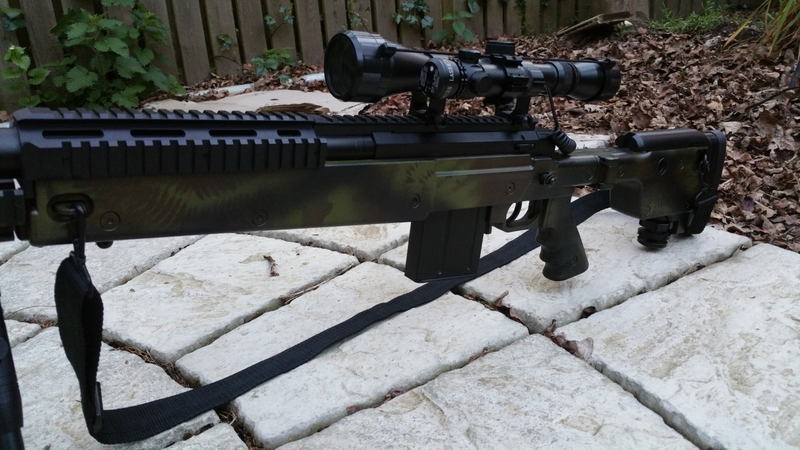 Liking the fern pattern on the top rifle, always a good looking foliage choice for spray jobs. The overwhelming internal rant mis-identified it as an AKS74U (mostly on account of the flash hider). But still. Grrrr. There is real steel AKSU in 7.62 too. I built one replica and it looked much better with a 47 mag IMO. The AKMSU? 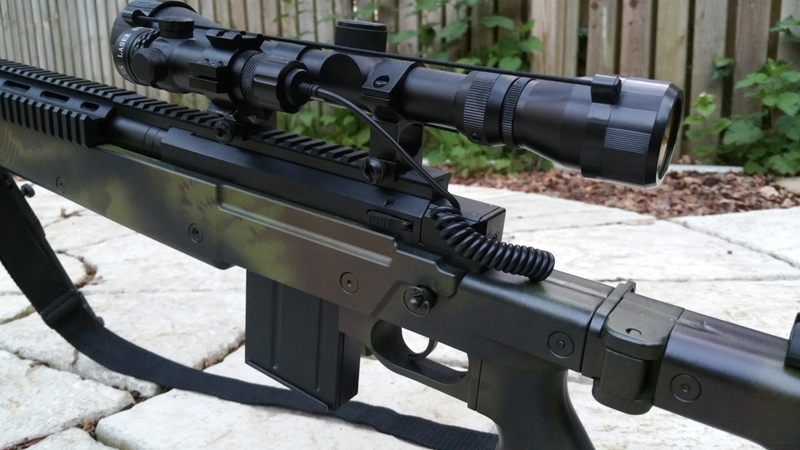 Yeah, actually the picture kinda looks more like one of those only with a Beta handguard of course. When I was looking for a small folding AK I was looking for an AKMSU but the only ones available were rare and out of my price range. @OP - Any further detail on the techniques you used, particularly the AK. Youtube has oodles of videos on such, but more is always welcome. For example, did you just dab it on - use a sponge - any particular method - multiple coats etc? I ask because I like it, especially the wood one. Sure, and thanks. The whole gun is sprayed black with Crylon. Apart from anything else it adds deep defenition to the highlighted areas later. Then a large wide flat brush, dry-brushing with gunmetal colour acrylic, and I do mean dry. Sparingly and slowly is the key to the best look. This will give the all over steel effect, then lastly the same technique on the highlighted and high wear areas with silver acrylic. Everything on these weapons was brushed apart from the base spray btw. For the wood it's an all over block coat of your chosen shade then when dry an all over wash of ink, in this case chestnut ink. Then a slow, lightand very dry-brush to edges and high wear areas with yellow and then ivory, blend carefully where required. Very light eges give a limed or bleached out worn effect as hopefully I've achieved here. The wood was indeed orange plastic so I'm pleased with the result. Two coats of a quality light satin spray varnish to finish. Hope any of this helps and thanks for all your comments/likes. Maybe it's made from Cylons? Am I nazi nazi to point out that it's "herr"? This is great advice, thank you for sharing.